The wording is bugging me. WoW. And I thought shaman didn\t have any healing. Pretty good. Also, I don't know if anyone else witnessed it, but this spell (with Mutate) enables some Gatgetzan Auctioneer combos. So this has Echo?! So they realy went this far just making up new text because they didnt want a 1x keyword in the set? wtf? This was basically mandatory if control shaman were going to be a thing. I don't understand why they didn't just make this an echo card. Strong card though. Both more AND less flexible than Forbidden Healing. Interesting. Same wording as Unstable Evolution. Echo is a Witchwood only card. That's why Flark's Boom-Zooka doesn't say Recruit. 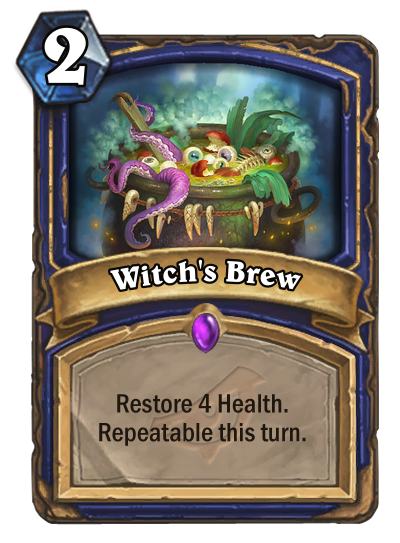 Don't get why they didn't just give it Echo, seeing how it is the callback card for Shaman. Because it's not Echo, right? Yeah, it's kinda dumb, but I guess some keywords are specific for the expansion they were introduced. Recruit isn't used even though we saw many "recruit" cards since K&C. Well Soup Vendor becomes less useless. but you'd need to take the damage first and in that case I'm not sure playing a 1/3 and healing for a bit is going to safe you from dying at that point. This can heal for 4, 8, 12, 16, or 20 HP. Now you just need to find a way to let Bogshaper stick for a turn, then it might become a powerful card in some sort of Control/Combo Shaman. Seems like a better Forbidden Healing to me. You can choose different targets to heal and it's more flexible, and given that it's in shaman and not in paladin that's even a bigger plus. Nice replacement for Healing Rain which is rotating out as well. All and all I love this card. Do they not realize that its actually more confusing to STOP using a keyword we're all used to than to get a newbie up to speed with a tooltip? OK let's compare it to healing rain. This heals for 12 with 6 mana. Of course you can heal for up to 20 but that means you have no mana left to do anything else, which means if you are losing it is not going to save you. Blizzard developers really have some weird thought process going on inside their head most of the time. Or they are just plain idiots thinking they are acting "cool" making keywords this way.